A high-quality awning can give you superior protection from sun and rain without sacrificing on style and convenience. If you’re searching for “awning installation near me,” turn to the certified installers at Paul Construction. We have built a reputation on providing durable awnings and exceptional customer service. We stock a wide range of shade solutions, from spot cover for windows to bigger awnings for decks and patios. Besides installing awnings, we also create custom sunrooms, outdoor kitchens and living spaces, post and beam additions, basement additions, and more. Call 610-287-1623 today to get a quote. A classic fixed awning can help you achieve a timeless look, but these antiquated shade solutions are often missing important quality-of-life features. 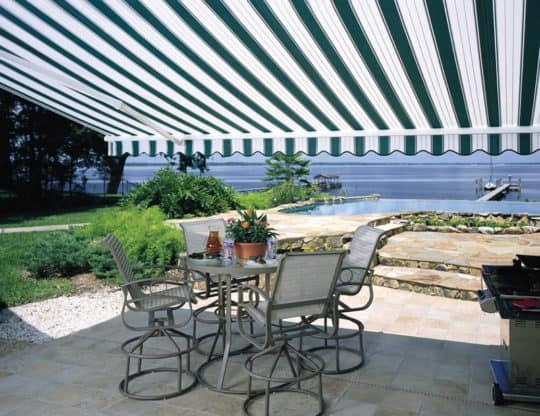 Our Sunesta retractable awnings can be customized or upgraded to accommodate your preferences. Whether you want the convenience of an electric awning or the flair of an LED lighting add-on, Sunesta‘s high-quality features are designed to simplify your life. And the choices don’t end there; these shade solutions are available in hundreds of combinations of fabrics, colors, and patterns. During your free in-home consultation, our pros will evaluate your property and offer suggestions regarding the type of awning that would fit your needs and the style that would complement your existing architecture and landscape. With our knowledge and expertise, we can advise you on the best size and design of awning to enhance your outdoor space. Throughout the process, our crew will be available to answer your questions and implement any design requests. Our team can also offer suggestions on how to upgrade other parts of your property. We promise to work quickly and diligently, installing your new awning within three weeks of your order. Whether we are installing an awning or creating an outdoor living space, we guarantee you will be satisfied with the results. At Paul Construction and Awning, we never take shortcuts. We are proud to offer a lifetime guarantee on our workmanship. To find out more about our awning installation, cleaning, and repair services, call us today at 610-287-1623.